Last week at San Diego Comic-Con, The Hateful Eight panel took place in Hall H. The panel was moderated by Chris Hardwick and introduced director/writer Quentin Tarantino and cast members Kurt Russell, Tim Roth, Bruce Dern, Demian Bichir, Jennifer Jason-Leigh, Walton Goggins, and Michael Madsen. 1. Quentin Tarantino announced that The Hateful Eight was filmed in 70mm, and the lens was an Ultra Panavision 70. Only ten films have been previously made with the Ultra Panavision 70 lens. 2. 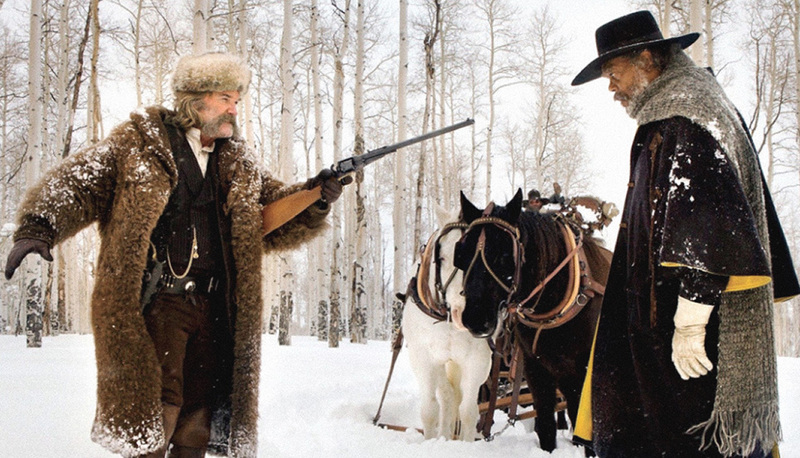 Tarantino will release The Hateful Eight in an exclusive roadshow event for select theaters around the country. The film will be shown in 70mm, and it would also have an intermission between each part. This roadshow will only be on Christmas day. 3. For the first time in a Tarantino film, there will be an original score. Not only that, but it’s being composed by the famous Ennio Morricone. 4. During the Q&A, Tarantino was asked about the controversy with the leaked script. He replied by saying it was only a first draft, and he wanted to do reading to feel it out. He was annoyed that the general public found out his process and the leaking of his work. 5. Lastly, we found out that Demian Bichir’s role was initially intended to be “The Frenchman,” but Tarantino later changed it to “The Mexican.” Bichir was cast based on a glowing recommendation from Tarantino’s good friend and fellow director Robert Rodriguez. If you’re interested in learning more about the film, check out the video below. Next ArticleTV Review: Rectify (3x02) - "Thrill Ride"